I love Mexican food. Whether it’s tacos, burritos, chimichangas, churros…I can’t think of a single Mexican dish that I don’t like! I even ate crickets while in Mexico – I am that trusting of Mexican food. They weren’t even that bad, just a little too salty for my taste! There are just so many different options when it comes to Mexican dishes, these 25 Must Try Mexican Recipes are just the tip of the iceberg! I’ve rounded up these amazing recipes not only for my own little recipe book, but for you guys too! I make a lot of enchiladas, but my favorite Mexican food to make isn’t really Mexican…it’s a southern style cornbread, kicked up a notch with Hatch green chile, a regional chili from outside of Albuquerque, New Mexico, where my husband grew up. 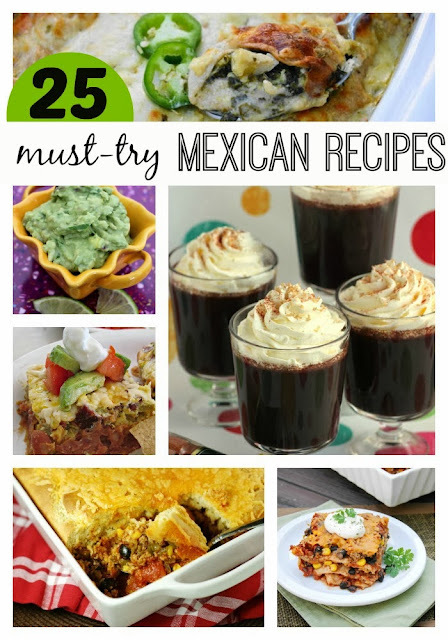 My recipe for the Mexican cornbread would go great with any of the recipes below! I especially like to serve it when I make enchiladas! I’d love to know what you think as you visit these awesome bloggers and take a look at their recipes. If you think they look good, please share them with your friends, and if you’re active on Pinterest, pin them! Bloggers work so hard on their food recipes, it really means a lot to us when you share them and we see new readers visiting our sites to check them out! Do you see any that you think will be a fast favorite? What is your favorite Mexican recipe? I would love to hear your suggestions for my next round up! Would like recipe for the coffee drink displayed in the pictures.